What’s a herbarium you ask? A place full of herbs? Sort of! A herbarium is a collection of dried plants, systematically arranged, sometimes filling entire buildings or in Hurricane’s case filling a large plastic bin. Throughout this past season on Hurricane, I have been collecting, pressing, and mounting plant specimens from all over the island. Not only are these dried specimens beautiful, but they also hold a lot of utility. Properly done plant collections are both a really useful teaching tool and provide information about the taxonomy, phenology, genetics, evolution, ecology, historical context, and systematics of each species and the environment it was collected in. All that from one single plant! Plant collecting as been around for centuries and many of those historic collections, despite some being over 300 years old, are still completely intact and stored in herbariums across the world. Want to start your own plant collection? Here’s how! Step 1. 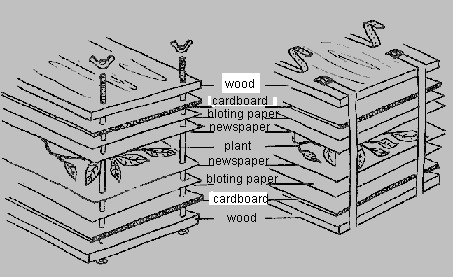 Build, purchase, or borrow a plant press. If you want to build your own, it’s super easy! All you need is two wooden boards of equal size, corrugated cardboard (same size as boards), newspaper, rope or straps blotter paper (or other very absorbent paper – i.e. watercolor paper) the size of the boards decides the size of your specimen so keep that in mind! I recommend boards that are about 12”x17” because if you decide to purchase acid-free herbarium mounting paper it’ll be easy to make sure your plant specimen will fit on the mounting paper. Step 2. Explore! Go outside and locate flowering or fruiting plants – if you’re collecting on land other than your own (your neighbors, a state park, etc.) always get permission before you start digging up plants & check to make sure your local laws don’t require you to have a collection permit. Bring field guides and a hand lens so that you can properly identify your plant to species! Be sure to take detailed notes of where you found your plant and to record the date. Step 3. Once you’ve chosen a plant that you want to collect, carefully remove it from the ground – making sure to collect it with at least some of the roots intact. I always find it helpful to have a pocketknife or something else that you can use to dig up the plant with. Carefully clean off any dirt from the roots or any other debris from the rest of the plant. Step 4. Get your plant into the press as quickly as possible! The longer it is out of the ground without moisture, the quicker it will begin to wilt and wilted plants tend to not press as well. If you are far from your press when you are collecting, bring a plastic bag with a damp paper towel at the bottom of it to store plants in until you can press them (make sure the bag stays relatively sealed & that the plants aren’t in there for more than an hour or two). Step 5. To put your plant in the press, arrange it how you would like on a piece of newspaper. This piece of newspaper should be stacked on top of a piece of blotter paper, a piece of cardboard, and one of the pieces of wood. I find it helpful to use a piece of newspaper the same size as my mounting paper so that I know it’ll fit the right dimensions. Make sure that at least a leaf or two is flipped upside down and that the plant is arranged as neatly as possible. Once arranged, fold over the other half of the newspaper or place another piece of newspaper on top of the plant and then place piece of cardboard on top of it. Step 6. Keep pressing! From here you can press as many plants as your press can hold. The key is to just keep layering with the pieces of wood always on the outside and layers of cardboard, blotter paper, newspaper, the plant, more newspaper, cardboard, and on, and on. Check out this helpful diagram. Step 7. After you have put all the plants you want in the press, using the rope or straps tightly cinch the press so that as much pressure is put on the plants as possible. Step 8. Check on the plants after a day or two – if they aren’t completely dry change their newspaper and put them back in the press for another day or so. If they are dry – you are ready to mount your specimen! Step 9. To mount your specimen, first make a mix of half Elmer’s glue and half water. Lay your specimen on top of a piece of mounting paper (generally a thick piece of acid-free white paper) and arrange it how you like. Then either carefully apply the glue mixture to the backside of the plant specimen or dip it into a thin layer of the paint. Then, carefully place it on the mounting paper – be sure to not glue down any of the fruiting or the flowering parts. Step 10. Make a label and attach it to the bottom right corner of the mounting paper with your specimen on it. See what a proper label should look like here. Step 11. CELEBRATE! You now have your very own plant collection! Don’t worry if it’s not perfect – it gets easier with more practice!